With the new live-sets feature you can switch documents on the fly and use your machine resources to the maximum. If you are not into EDM, chances are the music you play is based on the concept of songs or parts. If you can afford a few seconds of interruption between your songs, then the new live-sets feature is for you! By creating live-sets you can very easily group several documents together, and load them on the fly when needed. By having a document per song or part, it is possible to use all your CPU power and all your RAM for each song. This means you no longer have to try to balance the load and share plug-ins to contain all your performance in a single place. Instead every song can use a completely different patch, a different set of instruments and effects, as well as different samples. 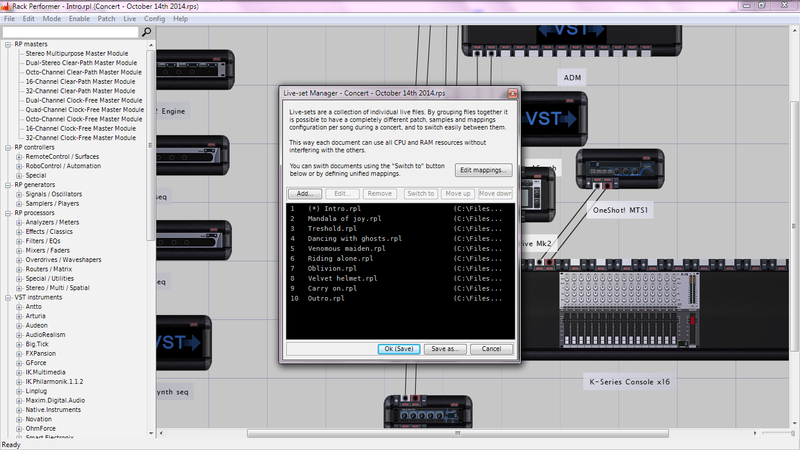 Live-sets are created and edited using the new live-set manager window accessible from the "live" menu. You can add as many documents as you want to the set and re-order them the way you like. Live-sets are saved as special .RPS files and can be re-opened later on like normal documents. To recall documents you can use the "switch to" button of the live-set manager but it becomes even more interesting if you define and use the unified mappings. With the unified mappings you just need to create a single keyboard or MIDI mapping (using the quick mapping cinematic) and it will work across documents (that is, without having to redefine the same mapping in every document) You create them once for all and they work for the entire set. Lastly there are two modes for the unified mappings: "direct select" and "free select". In "direct select" mode, documents are recalled as soon as the live-set select control port is changed. This is perfect if the order of your songs is predetermined and doesn't change, as you basically just have to press the "next" key or button on your controller to load the next song. In "free select" mode, you can pre-select any document in the set by changing the live-set select control port value and the document name will be displayed in the screen ticker. When the correct document is pre-selected, you then use the live-set validate control port to load it. This is a two steps process, making it somewhat more complex but it allows to play your songs in the order you want and change at the last moment, giving you maximum freedom over your performance.